No. 1486: What is Gold Worth? Click here for audio of Episode 1486. Today, what's gold worth? The University of Houston's College of Engineering presents this series about the machines that make our civilization run, and the people whose ingenuity created them. On wealth held and hoarded, on light-filled amber. And we catch the glint of gold in the tangle of an unsettled forest. Their craftsmen wrought bold, dramatic items of gold encrusted with jewels. Just the other day, Forbes magazine displayed a graph that put those old Saxons in a new light. It showed the price of gold in present-day dollars. The graph starts in the 14th century, when the stuff went for what would be two thousand dollars an ounce today. Immediately after, the Plague killed off half of Europe's population, and the value of gold fell to a little over one thousand dollars. What gold there was now belonged to half as many people, doubling the amount available. Then, with a shortage of labor, new technologies arose, and capital became important. The price of gold began rising until Columbus claimed the West Indies for Spain. It reached its all-time high of 2500 dollars an ounce. The Americas became a rich source of gold. As Europe plundered the New World, the price dropped until 1600, where it settled out at about 500 dollars an ounce. It stayed there until the industrial revolution. Then something strange happened. Gold prices began oscillating wildly, seeking out new lows. Each depression brought the value back up. In the late 1970s, gold rocketed to a brief high of 1400, 1999 dollars. But, by then, we'd separated gold from money. That brief spike represented short-term horse-trading. Gold had reached its all-time low of 200 dollars an ounce just before that. And at this writing it's worth around 300 dollars an ounce. 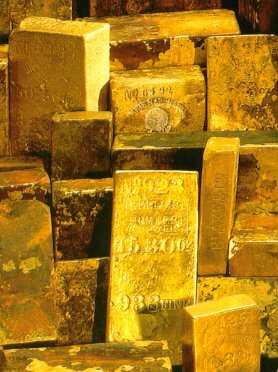 For centuries, gold was the most precious substance short of gemstones. Now many other materials are worth more -- platinum for one. As gold prices began to slump right after WW-II, poet Dylan Thomas wrote the wonderful line "There was a Savior, rarer than radium." The metaphor of gold was being displaced. Once we said, "He's worth his weight in gold." If he weighed 180 pounds, he'd've been worth seven million dollars when Columbus stumbled onto America. He'd be worth a tenth of that today. My 1911 Encyclopaedia Britannica devoted nine dense pages to gold. The current one brushes gold off in part of one page. It's a strange thing to wake one morning and find gold gone. But it is. Now it's just one more commodity among so many others. And a bit of magic has vanished back into those ancient pagan forests of Northern Europe. Brimelow, P., What is gold Worth? Forbes, October 4, 1999. I'm grateful to Carol Lienhard for spotting the Forbes graph and recommending an episode based on it.